On a few sunny days this spring, California’s solar and wind power plants generated so much juice that grid operators had to throw it away, or curtail generation. The sun was shining, the wind was blowing, but the generators were shut down. The state lost enough electricity from January through June to power 50,000 homes for six months. The flood of clean power displaced natural gas generation on the California grid. But even as all that extra power was tossed away, utilities in neighboring states burned coal for their air conditioners and televisions. It’s as if California avocado growers with a bumper crop had to watch their fruit rot on the trees, while folks in Colorado suffered a guacamole shortage. The problem is not that there’s too much renewable power; the problem is that the electrical grid is divided up in a way that makes it hard for different utilities to share power. Now, a growing cadre of renewable energy advocates, engineers and utility officials are working to fix that. 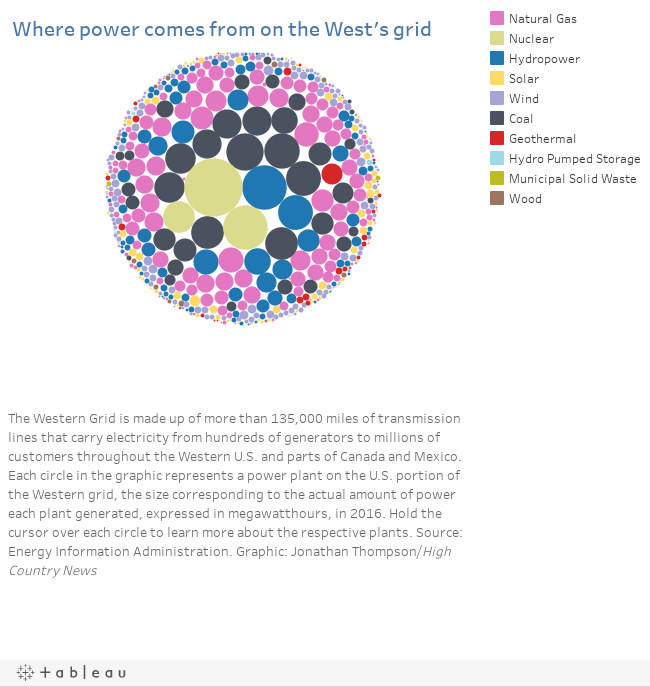 We often describe the Western electrical grid as if it’s a single, unified, vast machine comprising 1,000 power plants and high-voltage wires that reach across nearly 2 million square miles. We imagine electrons from wind plants in Wyoming zipping at the speed of light to laptops in California. Not quite. The grid is physically interconnected but operationally balkanized, broken up into 38 distinct islands, or balancing authorities. Critics compare it to a train with a separate driver for each car, or a creature whose every organ is controlled by a separate nervous system. It’s clunky and slow, suited to outdated power sources and antiquated modes of power consumption. “The current system is too balkanized in its operations, too costly to consumers and too inefficient in its use of power and transmission infrastructure to be successful,” says Carl Zichella of the Natural Resources Defense Council. The only way to take advantage of the increasing amount of renewable energy sources, and to abandon fossil fuels, he says, is for all the separate balancing authorities to come together as one. One of the initial seeds of the Western electrical grid was planted near the boisterous mining town of Telluride, Colorado, in 1891, when an alternating current was sent from a water-powered generator across three miles of copper wire to a motor in a high mountain mine. The planter of that seed was neither engineer nor inventor. He was Lucien L. Nunn, a twice-failed restaurateur who once studied law — a small man with a stork-like visage who idolized Napoleon. 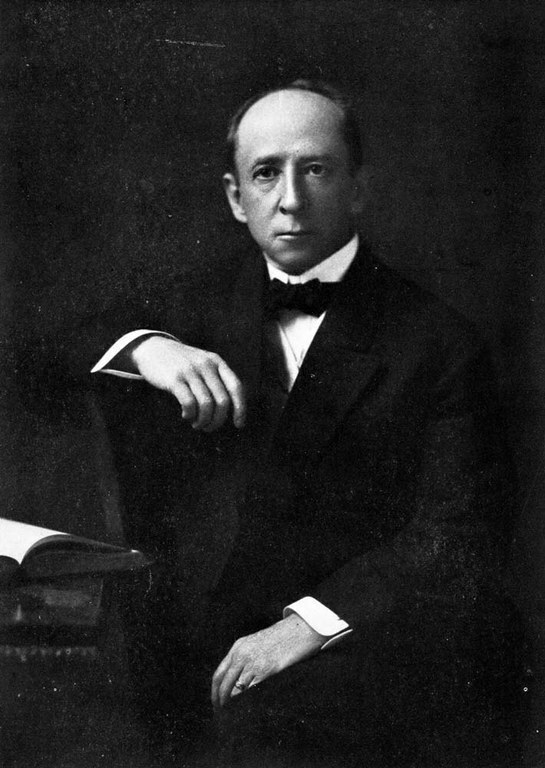 Lucien Nunn, who founded the Telluride Power Company in 1891. The Ohio-born Nunn headed West in 1880, first landing in Leadville, Colorado, then in Durango. When his restaurant flopped, Nunn and his companion and business partner, Malachi Kinney, headed to Telluride. They couldn’t afford a horse and had to make the 70-mile journey on foot. Yet what Nunn lacked in cash he made up for in ambition and nearly boundless energy. Plus, he had studied law in his youth, and legal services were in high demand in mining country. Before long, he had his own practice. In 1889, one of his clients, the St. Louis-based owner of the Gold King Mine (not to be confused with the Gold King Mine near Silverton, which famously blew out in 2015), asked Nunn to whip the venture into shape. The mine had tapped some rich veins, but the cost of hauling coal up to its lofty perch to power the mill’s steam engines ate up the profits. The logical solution was to use hydropower to power the mill’s crushers, stampers and sorters. But the mill sat at 12,000 feet above sea level, 2,000 feet above the nearest viable stream. Nunn couldn’t move the water to the mill. Maybe, however, he could find a way to move the water-generated power. So he brought in his younger brother, Paul, an engineer, to help. At the time, the burgeoning field of electricity was a yeasty free-for-all, with European and American inventors racing to develop and improve the technology, and a battle raging between Thomas Edison’s direct current and the alternating current backed by George Westinghouse and Nikola Tesla. Despite Edison’s grisly marketing tactics, which involved publicly electrocuting animals with alternating current to show how dangerous it was, the Nunn brothers opted for it anyway. This map shows the electrical distribution lines of the Telluride Power Company in San Miguel County, Colorado c. 1900. To keep the operation going, Lucien Nunn hired young men, opening the Telluride Institute to train them. Each student put a pin on a map, indicating where he hailed from, earning the moniker “pinheads.” One of the pinheads’ challenges was to match electrical supply with demand, otherwise known as “following the load.” If the mill operator wanted to crank up his machinery, for example, the pinheads would up the output from the generator, probably by cranking open valves to increase water pressure. Today, following the load remains a grid operator’s major responsibility. Other mine managers in the area liked what they saw, and the Nunns installed more generators to send the power of the area’s cascading streams to the mines, and then linked the generators to each other to provide redundancy and to make it easier to follow the load. This made it one of the nation’s first electrical grids, and it had a transformative effect. In 1901, the U.S. Treasury Department credited the Nunns’ Telluride Power Company with making San Miguel County a mining powerhouse. 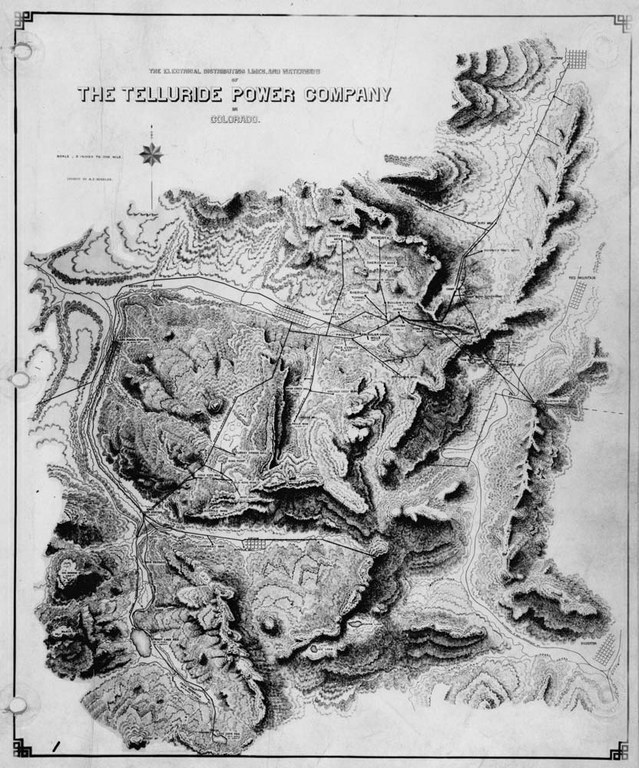 Telluride Power’s grids grew to include six big hydropower stations in Colorado, Utah and Montana, and close to 1,000 miles of transmission lines. They weren’t alone. Rival utilities put up their own grids, their wires sometimes literally crossing over Telluride Power’s in a tangled jumble in a largely unregulated field. But in the ensuing decades, corporate behemoths swallowed up the Telluride Power Company and other local independent utilities, combining them to create “super power systems” that served tens of thousands of customers each. The vertically integrated utilities were now monopolies — a model that persists today. 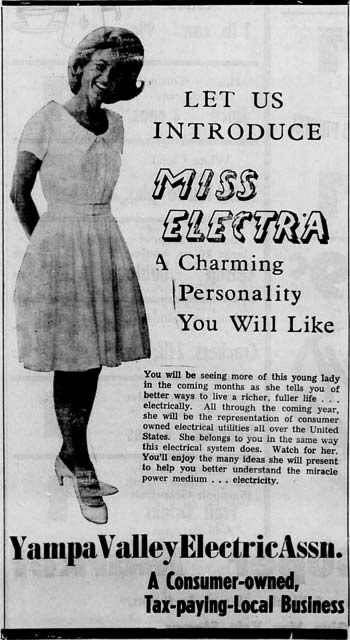 By the early 1950s, most of the West was electrified, and the monopoly utilities had become corporate and political powerhouses, their advertising mascots — Miss Electra and Reddy Kilowatt — hell-bent on getting people to devour more electricity with bigger televisions, more powerful air-conditioners and brand-new devices like electric can openers. The West’s population boom made it easy for the monopolies to rake in more customers and cash, so the utilities launched marketing campaigns to lure even more people to the region. But the growth also threatened to overwhelm their respective grids, which remained isolated from one another. In 1952, the U.S. Bureau of Reclamation proposed a new path forward with its “Study of Future Power Transmission in the West,” a blueprint for an overhaul and enlargement of the Western electrical grid. The Bureau envisioned a fleet of gargantuan coal-fired power plants constructed near the Interior West’s coal deposits. These centralized plants would then send juice hundreds of miles over high-voltage transmission lines to the “electrified homes” of Phoenix, Los Angeles and Las Vegas. Over the next three decades, coal plants sprouted in Utah, Arizona and New Mexico, allowing urbanites to live an electrified life without having to breathe the pesky pollutants that came with it; those inconvenient side effects were reserved for the rural folks near the facilities. The plants were tied into a huge web of long-distance, high-voltage transmission lines, skeletal switchyards, substations and energy hubs. The Bureau study’s vision of a coal-dominated grid had been realized. But the big, unified, networked grid? Not so much. Physically, the grid was integrated, but the unity didn’t extend into the operational realm. Instead, 38 separate entities, each with its own team of pinheads, operate their own portions of the grid. 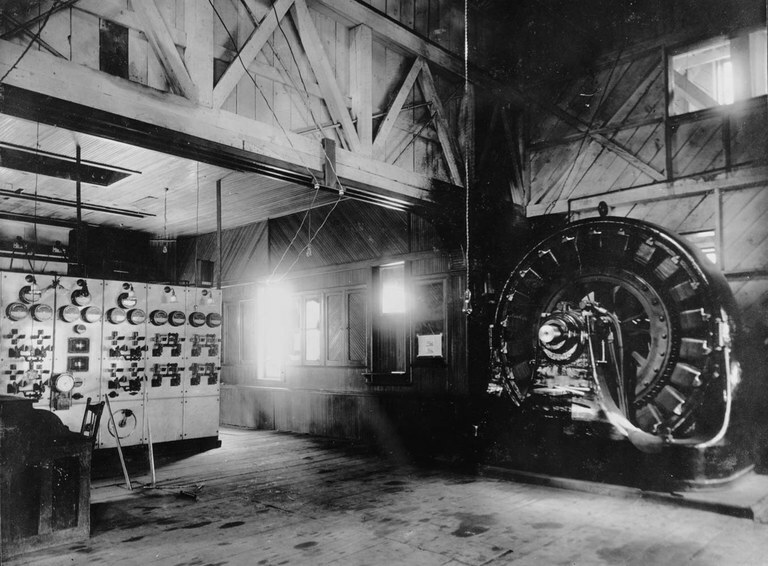 The switchboard, left, and generator, right, in the Ames Hydroelectric Plant in 1895. 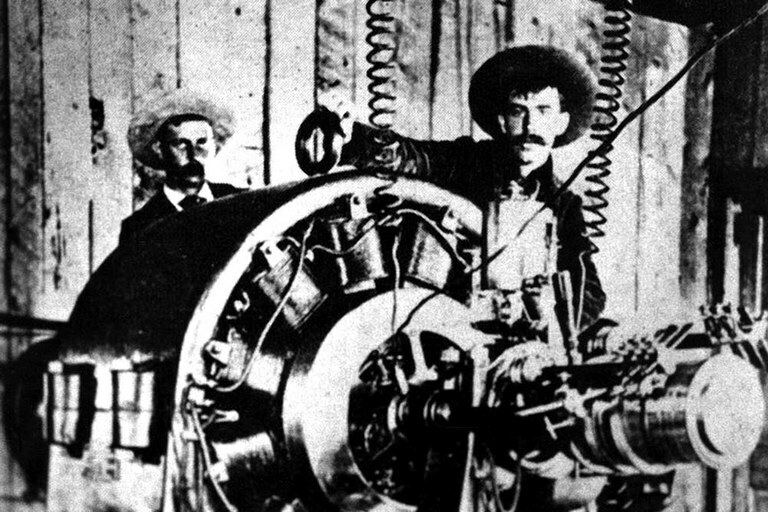 Workers pose in 1891 with the new 100-hp Westinghouse synchronous alternator at the Ames power plant, near Ophir, Colorado. The plant was the first commercial system to produce and transmit alternating current (AC) electricity for industrial use. Back in Nunn’s day, and even in the 1950s, the pinheads had to supply a reasonably steady demand. Factories and mines were the big power gulpers, and they operated on regular schedules. Residential customers also followed routines and consumed power in a predictable fashion. That meant that pinheads could schedule steady output fossil fuel generation to cover the base needs, and have the big hydroelectric generators on hand to cover any fluctuations. But today the old factories and mines and the 9-to-5 workdays are falling by the wayside. Patterns of electricity consumption are becoming more erratic as a result, wrinkling that once-smooth demand curve. Increasing amounts of solar and wind power have complicated pinheads’ calculations, as well. Because grid operators can’t control these variable power sources, they count them as negative demand rather than supply, further complicating the demand curve. Strong and steady coal won’t cut it anymore. Today’s pinheads need more flexibility and nimbleness from their power sources. For most utilities, particularly in the desert Southwest, the line delineating net demand is shaped kind of like a duck, with its belly sagging around midday, when demand is low and solar generation high, and a long, steep neck stretching back up in the late afternoon as folks kick on their air conditioners and solar drops off. In fact, this model is known as the “California duck curve” because it’s most pronounced in that state, with its high penetration of solar power. Pinheads don’t like ducks. If the belly dips too low, there’s a risk of over-generation, so the pinheads have to force power providers to shut down their plants, as happened in California this spring. But they still have to keep a whole fleet of backup generators — most often natural gas-fired — on hand and “spinning” to follow the demand curve back up that steep neck. That process creates a lot of emissions, and, as the neck gets longer, it becomes less and less sustainable. It’s one of the ugly realities the pinhead’s job: She must always have enough generating capacity around to meet the peak of the demand curve, even if that peak only lasts an hour per day. An integrated grid, as its proponents envision it, would allow multiple utilities to share that generating capacity. It would tear down the borders between balancing areas, bridge the rifts between the now-distinct grids with new infrastructure if necessary, create a centralized power market and put a single team of pinheads — also called an independent system operator — in charge of following the load of the entire West, with a huge fleet of generators at their disposal. Operators could then send excess California-generated solar power to New Mexico to meet that state’s demand peak, and pump Wyoming wind power California-way to keep up with the late-afternoon air-conditioner rush. A sort of integrated Western grid “lite” is already in operation, giving a sense of how the big grid would work. In 2014, the California Independent System Operator, or CAISO, which runs most of the state’s grid, joined up with utility giant PacifiCorp to form a centralized market where they could buy or sell power in real time to make up for unforeseen supply-and-demand imbalances. Several other utilities have joined, including Arizona Public Service and the Los Angeles Department of Water and Power. Salt River Project, the Arizona operator of the coal-fired Navajo Generating Station, signaled its intent to join the market shortly after the plant shuts down in 2019. Public Service Company of New Mexico, which is looking to ditch coal altogether by 2035, is also interested in participating, and NV Energy, which shut down Reid Gardner coal plant this spring, has long been a member. When California has extra solar, the market allows other participants to buy it far more cheaply than coal or natural gas, allowing neighboring utilities to displace some fossil fuel generation. The Energy Imbalance Market, as it’s called, or EIM, has so far saved participants $173 million, according to CAISO, and helped California avoid major solar curtailments. Yet the real-time EIM is a mere shadow of a truly integrated grid, because it applies only to imbalances, which make up just about 5 percent of the wholesale electricity market. The bulk of the market is made up of day-ahead trades, where pinheads use sophisticated models to forecast the following day’s net power demand on an hour-by-hour basis, then commit generators to ramp up accordingly. An integrated grid would take the EIM model and apply it to all power purchases. It would radically transform the way the Western grid works, and CAISO estimates that it would save participants more than $1 billion per year. “It’s cleaner, cheaper and more reliable,” says Zichella. 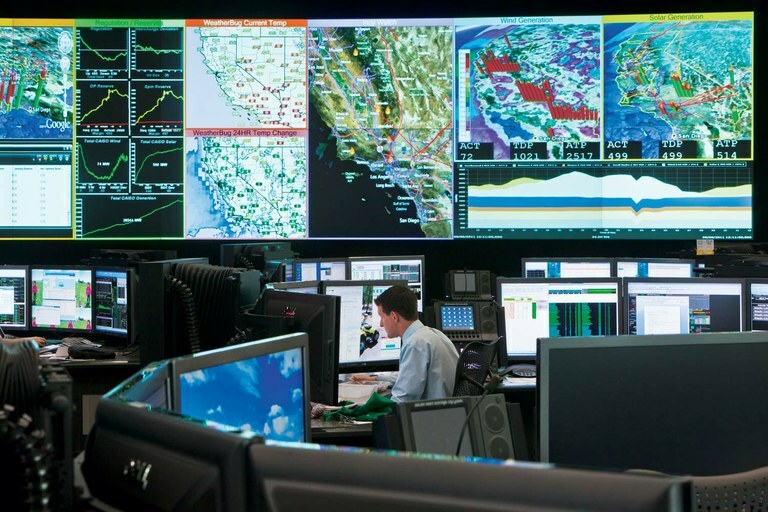 The control room of California ISO, where modern-day “pinheads” keep tabs on the state’s high-voltage transmission grid. For the most part, the current Western grid is technically ready for integration. Western politics, however, have thus far hindered the move to de-balkanize. Conservative Western politicians worry about giving up control: Put them on the same grid with California and they might be nudged into complying with the Golden State’s green agenda and high renewable-energy requirements. Coal-fetishizing lawmakers also are concerned that it would deal the death blow to their favorite fossil fuel. Their concerns are well founded, as the centralized market would put cheaper solar, wind and natural gas power in direct competition with the dirty old coal plants. California Sierra Club chapters, meanwhile, worry that the state’s green goals could be diluted by sharing energy with coal-heavy regions, since that would also open up new markets for coal-power sales. And it’s also possible that an Arizona utility might purchase cheap solar from California, but use it to displace its own solar generation and keep its coal plants running, thus resulting in no net reduction in emissions. But integrated grid proponents, and a number of independent studies, point out that coal-generated power is currently more expensive than other forms of power, thanks to cheap natural gas and a greater abundance of renewables. In the East, where regional grids and markets are the norm, coal is steadily losing ground. Even without an integrated grid, nearly every major Western coal plant has seen its generation decrease in recent years as utilities choose to draw from cheaper, more flexible generating sources. The integration effort is moving ahead, albeit slowly. Most of the utilities that are involved in the EIM are eager to take the next step toward full integration. California lawmakers are hoping to ease neighboring states’ concerns about loss of control by restructuring CAISO’s board to include members from other states.